The name change came about as a result of the "new gods" deciding they weren't so new anymore. They hung up their hats/tridents/lightning bolts and passed things over to a more game-related name, hence the bit about Kul. You buy that story, right? Good! Now you can sit like the rest of us and ponder who exactly Kul is and what's so important about his or her hand. Dibs on "it's a metaphorical hand, silly". Gameplay in Hand of Kul puts you in the role of Caos, a giant warrior out to destroy the rival gods' shrines, kill their titans, and make the gods you serve a little more prominent in the eyes of the people. Sort of like the Crusades, but with wolves, giant ogres, and other gargantuan bosses. Co-op is a bit non-traditional and doesn't put players in the arena together. Instead, you send curses or blessings to each other's levels as part of a parallel multiplayer experience. There's no official count for number simultaneous players, but figures between 4 and 32 have been thrown around. 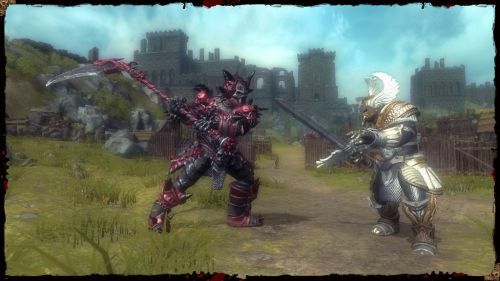 Ascend: Hand of Kul should be released by the end of the year on PC and XBLA. Page created in 1.0416 seconds.